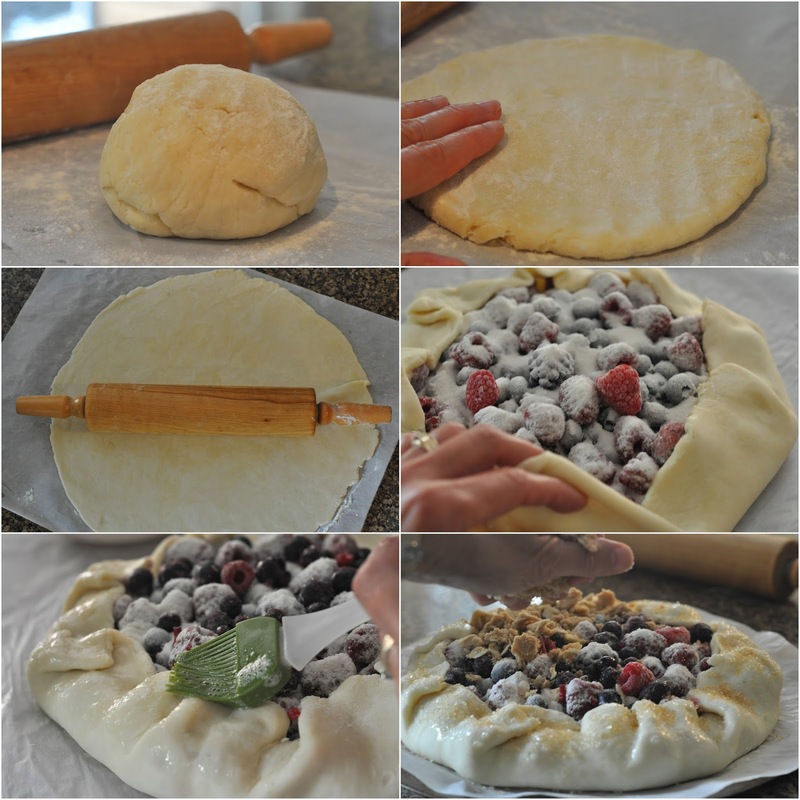 With local berries at their peak it's easy to grab baskets of berries at a passing fruit stand, but you can also use frozen fruit for this rustic pie. Cut butter into sugar, flour and almonds, using pastry blender, until you can easily shape into crumbs with you hands. Roll out to about a 16 inch circle, using flour to dust as needed. Transfer with parchment paper onto pizza pan. Brush pastry with some of the egg wash and spread with berries, leaving about a 3 inch border. Fold pastry edge over the fruit, brushing top of edge with the rest of the egg wash. Sprinkle pastry edge with coarse sugar and sprinkle fruit with crumb mixture. Trim off extra parchment paper. Bake in bottom third of oven for 15 minutes, then turn down the temperature to 350 F and continue baking about 45 minutes until juices bubble through the crumbs. Lightly cover crumb section with foil for final 15 - 20 minutes if they get too dark. Place pan on rack to cool to room temp or serve slightly warm with ice cream. Yummy - never taken the time to make one,going to have to give it a try. What a treat! I'd like some!